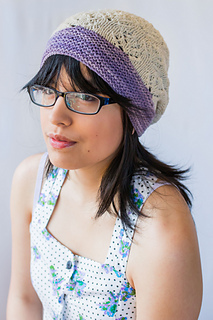 Purchase the Fields of Lavender Hat and Shawl together and get 10% off the set. No code needed. Previous purchases of the hat apply to this discount! Lavender is one of my favorite flowers. Used extensively in aromatherapy, this flower aids in sleep and relaxation, making it a popular scent in massage parlors and essential oils. The Lavender Fields in Southern France (where my father is from) are a popular tourist attraction that brings happiness, serenity, awe and splendor to those who visit. The Fields of Lavender set was made in collaboration with Gregoria Fibers; the yarn being a major source of inspiration behind the design. Anna, the magic-maker behind this yarn, infuses essential oils into the yarn when it is being washed, so the final skeins carry a calming scent, one that immediately made me think of Lavender Fields, along with the deep rich purple of her Dogwood color-way. Upon further research on this flower, I found myself drawn to its symbolism of grace, elegance and femininity, which helped determine the look and feel for this collection. 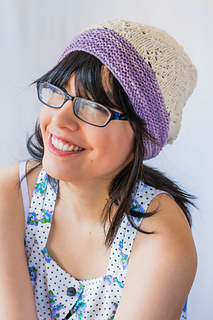 The Fields of Lavender Hat combines the simplicity of garter stitch spruced up with short row shaping that even a newcomer to the technique can fearlessly do, with the elegance of lace knitting; the stitch pattern resembling the small flowers this design was inspired by. Immerse yourself in the experience by letting your soul wander through the Lavender Fields in Provence as you knit up this delightful pattern. Needle: US size 5 (3.75mm) 16” (40cm) circular needle and size 5 (3.75mm) DPNS. A long circular needle, such as a 32”, can also be used to work the magic-loop method. Yarns Used: Gregoria Fibers Sport Base (Sport / 2ply ; 100% Merino ; 300 meters ; 330 yards / 100 g). Two color ways used, Natural (MC) and Logwood (CC). As always, when you purchase an Aroha Knits pattern, you can be assured that the time and effort has been taken to ensure an enjoyable knitting experience. 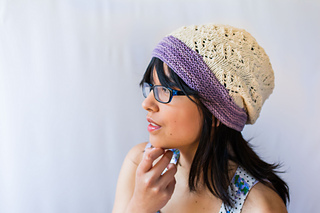 You will get a well-written pattern that has been professionally tech-edited and test knit for errors and clarification. 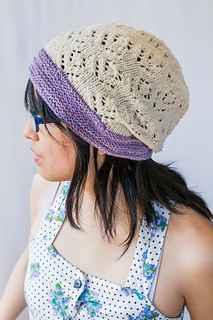 Complete with beautiful photography of the design, links to tutorials on advanced techniques, and an easy to follow pattern layout, with written and charted instructions. 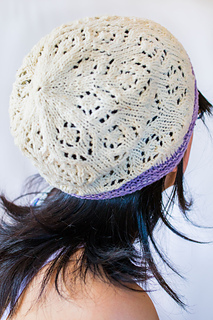 You’ll be able to relax and unwind with your new project on the needles. 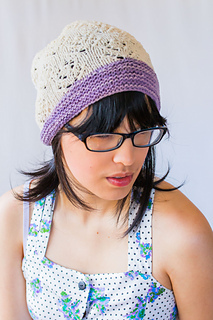 If you require further assistance, don’t hesitate to email me or drop a note in the Aroha Knits Ravelry forum!